Today it is all about the beef. The cattle went to the butcher a few weeks ago. And now the beef is ready for pickup and delivery. Half went the other day and the rest is today! 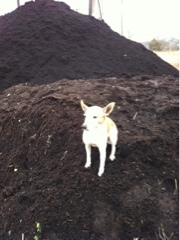 And then this mountain of compost gets moved to the vegetable beds. Starts are in, and more go in weekly. It's on!